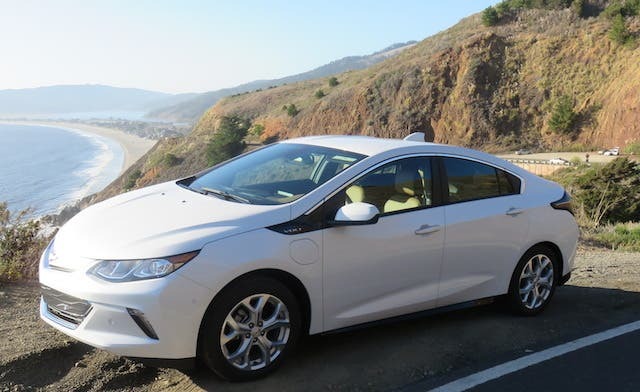 As Chevrolet prepares to make the much-anticipated 2016 Volt available in several lucky states (and Canada), we’re all anxious to see how the new model looks compared to earlier versions of the Volt. 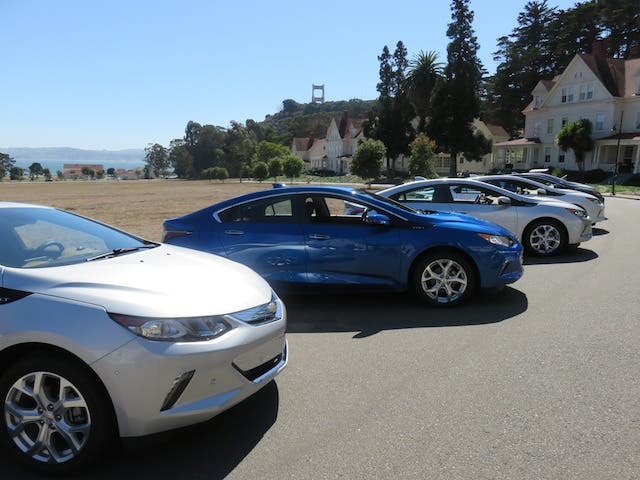 At the 2016 Chevy Volt media drive this week in San Francisco, I was fortunate to see many of the Volt’s new features myself. And fortunately for you, I got a little snap happy. Here are some pictures of the Volt outside the showroom and on the road. According to product designer David Geese, the 2016 Volt’s exterior was inspired by two things: muscular athletes and sand blowing through the wind. I can see the athletic look of the car in its tapered edges and sleek finish. Also, any car that can look this good after driving up and down Highway 1, through dusty farm fields, and over quite a few hills must be sporty. I’m still struggling to see the sand-blasted metal inspiration, but perhaps that’s a good thing. Unfortunately, it wasn’t dark enough to turn on the new LED headlights. Next time. While it was hard to capture the ocean from this angle, I did manage to capture a new exterior feature on the 2016 Volt: wraparound tail lights. These new lights don’t just look cool, they help smooth out airflow. 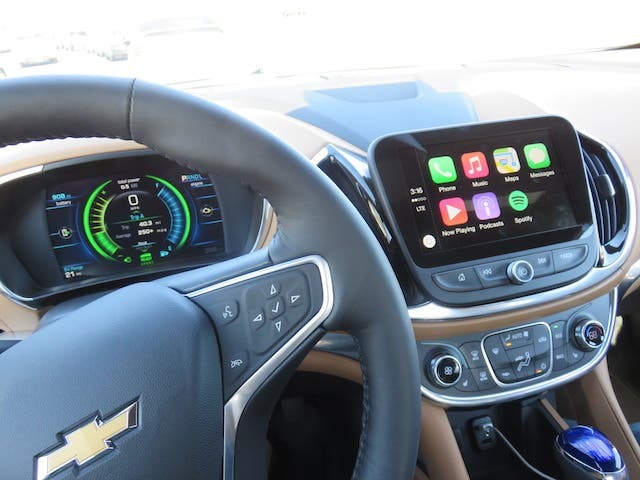 Chevrolet listened to its customers and separated the 2016 Volt’s infotainment from its climate system. Here you can see a pretty conventional knob and hard-button climate system under the very high-tech, touchscreen console. While it doesn’t look as futuristic as previous models, it was easy for me — a new Volt driver — to figure out how to get myself comfortable quickly. At the bottom of the picture, you may notice the pretty blue cap on the gear shift level. A throwback to the space-age design of earlier Volt models, the cap is just a little aesthetic reminder that you’re in a different kind of car. Some people have complained that gear shifts take up unnecessary space, but I really liked the way it looked; perhaps, I’m just a mainstream type of person. I was able to connect my iPhone to the car easily with Bluetooth. Once connected, my phone’s apps appeared on the touchscreen console, enabling me to access my phone’s features while not compromising my safety. (Voice-activated texting is a better safety feature, in my opinion, than the rear camera.) Just be careful your friends don’t text you anything embarrassing when your Mom is in the car. Back to me being mainstream, the roomier interior was my favorite part of the 2016 Chevy Volt. 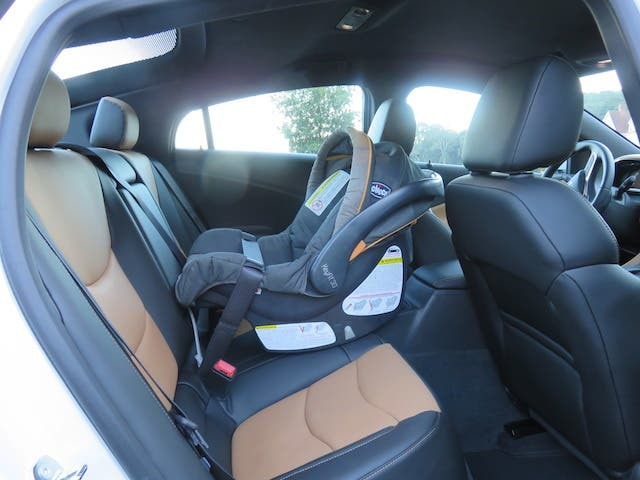 When I was shopping for a new car last year, I couldn’t justify getting the Volt because a four-seater wasn’t practical for my growing family. But the middle seat and extra leg room in the back changes things. Even with my carseat strapped to the middle seat (the safest place for a car seat), there was room for passengers on each side. I did manage to fit my small stroller in the trunk — though, the fit was tight. If I had a sport-utility or double stroller, I don’t think it would have fit. Perhaps Chevrolet can offer more trunk space on future models. You don’t even need to pop the hood or press power to judge the 2016 Chevy Volt. Aesthetically, the car manages to walk the line between convention and innovation; it’s a mainstream sedan with modern features and cutting-edge technology. This is exactly what Chevrolet set out to accomplish with its next-generation model.